The Azimut 116 is the new flagship of the Aviglianese fleet. The first example, launched in March 2004, was a rather atypical case for this boatyard used to series construction, with just slight variations requested by the owners. 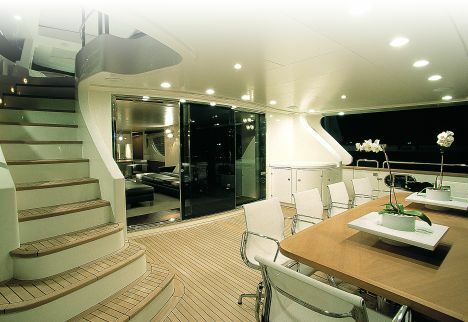 For this boat a very different interior design was requested from the classic base lines of a modern 35-metre pleasure yacht for the simple reason that it has more than one owner and although it cannot be referred to as a day cruiser, rather an exaggeration given its 116 feet, it will be used for short cruises in the tropical seas. Let's hear how the Mexican architect Mauricio Gomez de Tuddo, in charge of the interiors, interpreted the clients' requirements. Architect, what were the owners' exact requests? 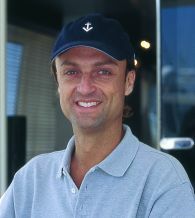 The owners, lovers of scuba diving and the tropics, albeit with very little time at their disposal, asked for a fairly fast large yacht, suitable for short cruises, with more attention paid to relaxation than to formal details, completely doing away with the idea of charters and representative use. Equally important requests were for fairly simple service systems, robust finishing details and easy-maintenance interiors, to avoid problems caused by lack of specialised technicians on the coasts where the 116' will mainly be sailing. How did you interpret these requests and how did you find working with Azimut? On the invariable structural layout of the 116 we chose to locate the four owners' cabins on the lower deck: simple and functional, purely for sleeping and so pretty much removed from the concept of an owner's suite. 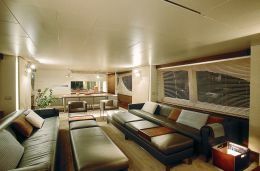 In this way we were able to give more importance to the relaxation zones, in the saloon and the so- called "media room", obviously as well as the roomy areas of the cockpit and flying bridge for life in the open air; careful use of panels, Venetian blinds and mirrors meant that light and depth could be controlled, however giving an impression of brightness in each room. Even from the other side of the ocean there was no difficulty in supervising the work in progress thanks to fast dialogue and positive collaboration with the Azimut Style Office. Our studio has worked in the building trade for twenty years; this is the first yacht we have designed. We have transferred adequate scaled residential solutions to it: low horizons, longitude aspects, flowing space without obstructions and every trick possible for lifting the virtual height of the rooms. When asked how satisfied he and the owners were with the completed job, the young hidalgo smiles. My friendship with the owners obviously means I can personally check the functionality of the ideas developed while sailing, if necessary smoothing out imperfections, metaphorically and otherwise; however I think the results obtained are good and satisfy the clients. That's that, until our next project!